Welcome back, fictionistas. While last week we took a closer look at the Second Story experience in Halo: Nightfall, this week we get to hear some diverse perspectives on both writing and playing stories within Halo, as well as clear up a bit of colony confusion a couple of fans might have. Let's get started! In case you haven’t heard, Issue 15 of Halo: Escalation launched not long ago and continues the story that first began in Halo: Spartan Ops, as the crew of the UNSC Infinity attempt to track down Jul ‘Mdama, Doctor Halsey, and the vital missing half of the Janus Key. It’s definitely worth jumping into, as fans of both Halo: Spartan Ops as well as folks looking forward to the Halo 5: Guardians campaign should find plenty to pique their interests. With that in mind, I caught up with one of 343’s wild wordsmiths, Brian Reed, whose tireless efforts are integral to the stories being told in each of the aforementioned tales. Let’s see what he has to say about sewing stories into the fabric of Halo. 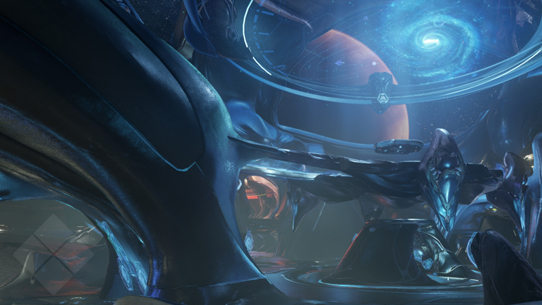 GrimBrother One: What is personally your favorite corner of the Halo universe to work or play in? Grim: What can you say about the relationship of comics to games? What are some of the advantages and disadvantages of getting the story across in each? Brian Reed: We work to keep our universe coherent across all mediums, so the comics “count” as much to Halo canon as a game (or a novel or live action series). The nice thing about comics is how fast you can put new story into the channel. Every 30 days we can give a new chunk of Halo Universe lore to the fans, and that’s a speed that you just can’t match with games where you’re working for a upwards of a couple of years to ship a campaign story. Grim: Any particular episode of Halo: Spartan Ops you consider your favorite? Brian Reed: The part of building Spartan Ops that I enjoyed most was the chance for the audience to learn more about Halsey, and for all of us to meet Roland. The start of episode 6 when Halsey lamented how she would never know everything is my favorite scene of the series. She’s laying her soul bare for maybe the first time in her life and Palmer is feeling so betrayed that she doesn’t get it. Palmer just sees a woman who has been knowingly committing an act of treason. I also love the start of episode 7 where Roland is honestly trying to understand who Halsey is and why she does the things she does. He’s wonderful fun to write and to spend time with. 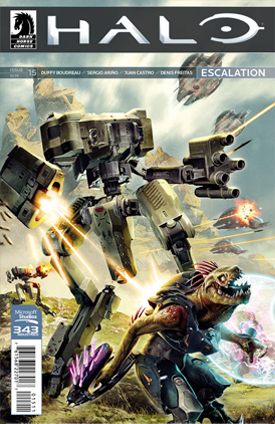 Grim: What issue of Halo: Escalation did you enjoy working on the most? Brian Reed: My favorite was issue 7, where Thorne goes home to New Phoenix. We’d just done six issues of planet hopping while space ships blow up. There was betrayal and infidelity and lies and just huge crazy events, and we knew the next arc was going to essentially be Chief vs Didact: Round 2, so there was the desire to do something much smaller. What came about was this quiet story about a man dealing with the loss of a loved one. In Halo stories we talk so much about ships or colonies or whole worlds being destroyed, but we very rarely get the chance to stop and talk about what that means, and how it affects people on a very personal level. It was really nice to be able to do something so tonally different, yet still so obviously Halo. 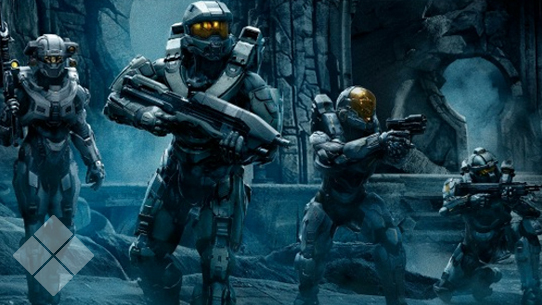 Grim: What can fans expect from Halo: Escalation in regards to how it ties in with Halo 5: Guardians? Any cool teases lore-lovers might get excited about? Brian Reed: Duffy Boudreau is handling the writing duties on the comic now, and is doing an amazing job with the continuation of the Spartan Ops saga. Between now and Halo 5 hitting the shelves, Duffy is doing some amazing things. Things that will result in ONI agents being dispatched to my office if I say too much. But listen, if you’re not already reading, you should know Duffy has already introduced plot threads that come up in Halo 5. In the months ahead, Duffy helps us introduce some new and very important characters. He wraps up the Janus Key plot from Spartan Ops, and in doing so actually shifts the galactic balance of power in a very key way for the story we’re about to tell in the game. By the way, a nice lady from ONI just walked up to my desk and informed me I have said enough, so I will stop talking about upcoming plots now. Oh, she says I’m done saying much of anything to anyone for today and I should go with her now. She’s resting her hand on a holstered pistol and telling me to stop typing. So, um… bye for now(?). While our cozy little content corner certainly continues to center around the narrative and story-based aspects of the Halo experience, we’re not immune from the excitement surrounding the Season 1 Finals of the Halo Championship Series taking place this weekend at PAX East. With that in mind, I thought it would be cool to hit up 343 Industries’ resident Pro Team for a quick little Q&A. For those of you who might think four-shots are something you’d order at a bar however, have no fear. We’re not talking BR-spread or KDA. In fact, I thought it would be cool to ask the Pro Team what they thought about more story-centric experiences, and show off the fact that just because these lords of Lockout are wizards in the War Games doesn’t mean they don’t love heeding the campaign call. So let’s hear what GH057ayame, Neighbor, Dersky, and Strongside have to say about some of their favorite parts of the Halo universe. 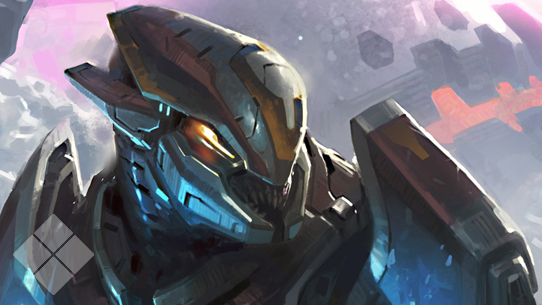 GrimBrother One: What is your favorite character in the Halo universe? GH057ayame: My favorite character has to be Master Chief. I’ve spent so much time living out his journey time and time again that it just feels like I’ve had a profound impact on his story as well. Whether it be destroying the original Halo ring or engaging some Final Bosses, I’ve always felt that I’ve ensured that Master Chief lived up to his name. Neighbor: The Flood as a whole. Dersky: Master Chief, he destroys absolutely everything the Covenant throws at him, and saves the entire galaxy! Grim: What is your favorite campaign moment from any Halo game? GH057ayame: My favorite campaign moment has to be when Master Chief and his marines enter “into the belly of the beast” when floating up into the Truth and Reconciliation on the 3rd level of Halo: Combat Evolved. Playing through this moment with my twin brother Brent gave us endless memories – specifically some of the toughest encounters that I’ve ever had in a Halo campaign. And who can forget… the INVISIBLE SWORD GUYZ. So many heroic moments were stopped abruptly by those jerks! Between that, and launching ourselves 1,000 feet up in a Warthog on Silent Cartographer, it’s a hard decision, but I’ll side with the sword-wielding Elites. Dersky: Mission 2 – “Halo” – from Halo: CE. I loved this moment so much because it was my first time ever interacting with a Warthog and I thought it was so badass at the time. Strongside: At the ending of Halo: Combat Evolved, driving the Warthog through all the explosions on the Pillar of Autumn was unforgettable. Grim: What is the saddest moment in any Halo story? GH057ayame: The saddest moment to me has to be when you see Captain Keyes assimilated by the Proto-Gravemind on the level Keyes in the Halo: Combat Evolved campaign. I mean… Captain Keyes gave me my first Pistol, so I’m forever in his debt. Neighbor: Overall as a game, definitely Halo: Reach. So many tough losses in that campaign. Strongside: Sgt. Johnson’s death in Halo 3. Grim: Which character in Halo would be the most fun to hang out with? GH057ayame: I think I’d love hanging out with Sgt. Johnson the most. I’ve always wanted to kick back, grab some beers, and listen to his war stories. Dersky: Sergeant Johnson. I picture our day would consist of smoking cigars and blowing [REDACTED] up! Strongside: Hands down the Master Chief. Grim: Which Halo vehicle do you wish you owned in real life? GH057ayame: I wish I could own the original Warthog from Halo:CE. That thing was so damn fun to drive around Alpha Halo, whipping turns and sliding into trenches. I can’t even begin to imagine how much fun that would be to do in real life – the handling was just pure bliss. Grim: What do you find most interesting about the Halo story? GH057ayame: To me, the most interesting thing about the Halo story is its overall mysteriousness. It’s a vast universe that’s yet to be completely explored – a feat that seems near impossible to be accomplished. But at the same time, it’s what keeps me going. I’m always yearning for the next story of the saga! Neighbor: I find it interesting that the hero of humanity can love an A.I. Dersky: It's truly amazing how the Master Chief never stops coming back to fight. He is clearly outnumbered in almost every scenario and still manages to come out on top. Strongside: The mystery behind the Master Chief, and who he is as a person. A couple of our fervent fiction fans asked about a few specific details regarding the colonies in the Cygnus system that we thought would be helpful to make a bit more clear for everyone. The Cygnus system contains two habitable worlds. Cygnus II (birthplace of Chyler Silva) and Cygnus III, which fans know as New Jerusalem. New Jerusalem’s capital city is also known as New Jerusalem, as is the case with several other human colonies since their first solitary population hub was synonymous with the planetary colony itself. In Halo: Contact Harvest (pg.61), we see that as of 2524 CE “…Avery [Johnson] didn’t understand why the Insurrection hadn’t flared in outer systems such as Cygnus…” This is a bit confusing when comparing it to the Halo 4:Forward Unto Dawn “Squad” promotional piece, it states that Silva "…grew up around a lot of insurrectionist violence, and to me it seemed quite normal. It wasn't really until being here that I realize how much violence I saw." It’s important to note that while Silva was born on Cygnus II, as a proverbial military brat (with both parents in the UNSC), she moved at a rather young age and spent a good portion of her youth on Mamore, a human colony that saw nigh perpetual unrest between the UEG/UNSC and various rebel factions. 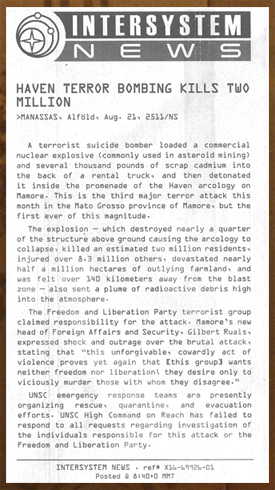 Fans may recognize Mamore from the contents of Halsey’s Journal, specifically within a news clipping from Intersystem News, which details the tragic terrorist bombing within the Haven arcology on Mamore in 2511, prompting a further-bolstered presence on the colony shortly thereafter – which Chyler’s parents were part of. Well, that’s it for this edition! Don’t forget to go and grab Halo: New Blood, and check out the HCS Season 1 Finals this weekend! Also be sure to check out the new Universe entries out this week, where we’ve got a smattering of goodies that you might find worth your ocular investment. Until next week… Live well, play Halo, and don’t try to come between brothers. Specifically if they’re Mgalekgolo.